1. Preheat oven to 350 degrees. Gently pull out mushroom stems, leaving caps intact. Set the caps aside and mince the stems. 2. Heat the oil in a medium skillet and add the garlic; cook 30 seconds or so until it becomes fragrant. 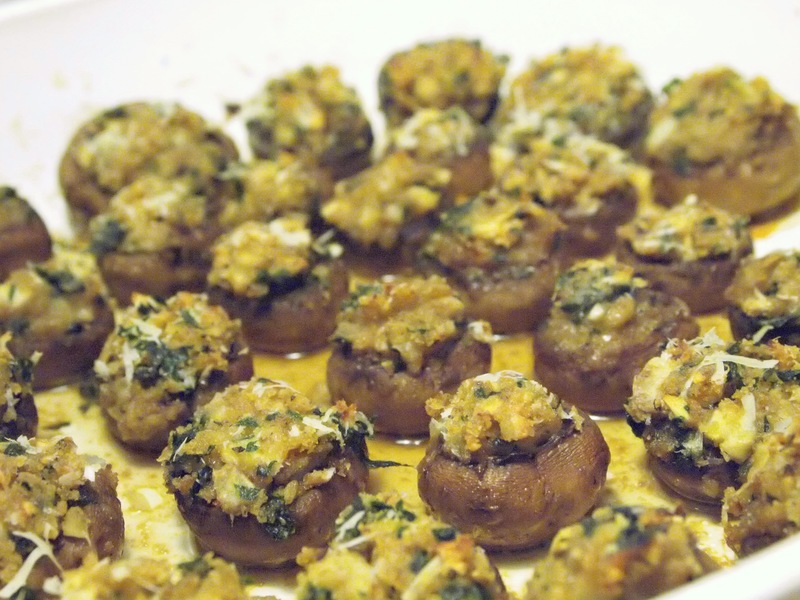 Add the parsley and mushroom stems and cook for about 3-4 minutes until they soften and cook down. Toss in the breadcrumbs; remove from heat and add the grated cheese. 3. Grease a pan big enough to hold the mushroom caps (I used a 10-inch Corningware). Overstuff the mushroom caps with the breadcrumb mixture and place stuffing-up in the pan. Drizzle olive oil over (or spray with an oil mister) and grate a little cheese on top. 4. Bake about 30 minutes until the stuffing starts to brown on top. Update: My mom wrote after I posted this to remind me 1) that this recipe usually takes oregano as well as parsley, and 2) that it came from our family friend Marie (a seriously amazing Italian cook – she hosted the million-course Christmas Eve meal I talked about here). These mushrooms were the subject of conversation on a New years eve car trip – what a coincidence! Wonderful picture of the dish!